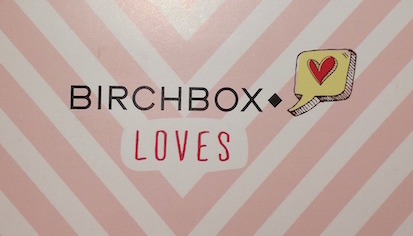 The theme for this months box is ‘Birchbox loves,’ which is obviously inspired by Valentines Day (which just so happens to be my birthday!). It is a month-long celebration of all things love over at Birchbox where they're discussing their own loves over on the Birchbox blog and are encouraging everybody to join in and share their own, too! 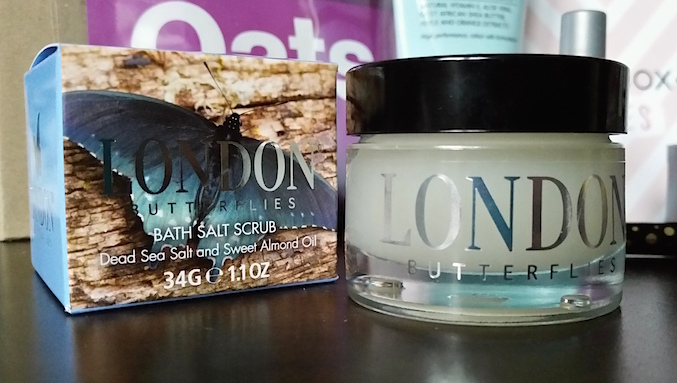 London Butterflies Dead Sea Salt & Sweet Almond Oil Bath Scrub is a body scrub that deeply cleanses and hydrates the skin for super silky, hydrated skin. It is made up of high quality, British ingredients and claims to offer relaxation as well as deeply cleansing and brightening the skin. The scrub itself is a creamy white and the salt particles are quite small rather than large and scratchy. To use, you need to massage the scrub into damp skin and rinse. This bath scrub is AMAZING. Seriously, I am head over heals in love with this scrub! Upon use, you can feel the scrub not only exfoliate but simply melt into the skin, leaving it feeling luxuriously smooth and soft. It’s a bit like a combination of a scrub and a butter and the results are fantastic. Before receiving this in my Birchbox, I had never even heard of this brand or product. Now, however, I am obsessed with it. Thank you, Birchbox! You can purchase a full-size, 225g jar of London Butterflies Dead Sea Salt & Sweet Almond Oil Bath Scrub for £35 from Birchbox. Liz Earle’s Botanical Shine Shampoo is a natural shampoo for all hair types that contains West African shea butter, apple and orange extracts, vitamin E and naturally derived cleansers to gently cleanse the hair and leave a beautiful shine and silky soft hair. It is free of SLS and harsh cleansers. The first thing that you notice about this shampoo is the scent. It smells like oranges, but this comes as no surprise as it contains orange extract as well as apple extract. It lathers up well and rinses easily. Once dry, it leaves the hair soft, shiny and bouncy - just what we all want from a shampoo! As a fan of natural shampoo, I find this one to be a great choice and I recommend giving it a try! 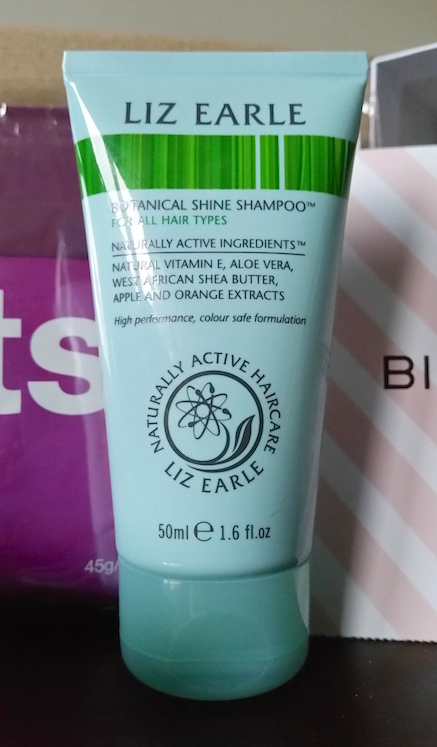 You can purchase a full-size, 200ml bottle of Liz Earle Botanical Shine Shampoo for £10 from Birchbox. 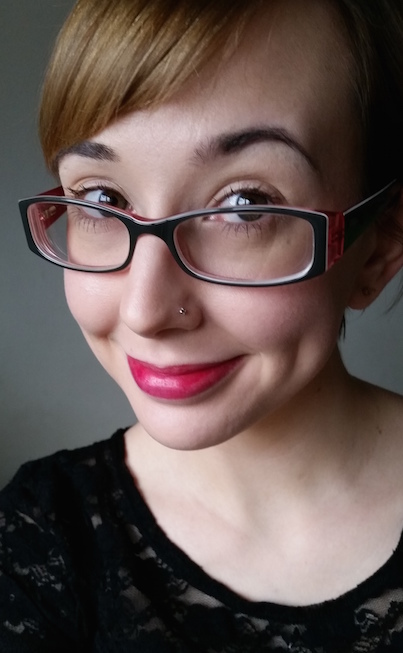 theBalm Stainiac in Beauty Queen is a lip and cheek tint in a sheer red shade. Whilst it looks quite bold and dark in the tube, once applied it is far more subtle and natural but can still be built up to achieve a darker and more vivid shade. To use, you need to either apply to the lips with the wand as you would a lip gloss, or apply a few small dots to the apples of your cheeks and blend into the skin with your fingers or a brush. As it is an "aloe-infused, gel-based" formula, you get a little extra time to blend into the cheeks or lips than other types of lip and cheek stains. Therefore, as long as you blend well, you shouldn't have any noticeable streaks left behind. When used on the cheeks, I found that it blends very easily and looks like a natural flush of colour rather than a bright pop of colour. On the lips, it is a sheer but buildable red. The lasting power is pretty good. It lasted all day for me on both the cheeks and lips, even through eating and drinking. It also didn’t leave any lipstick stains on the edge of glasses. This is a sample that I will definitely be using up and potentially buying! 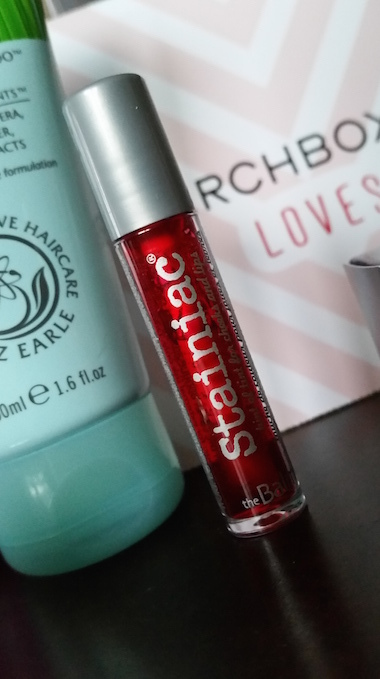 You can buy a full-size, 0.3oz/8.5g tube of theBalm Stannic in Beauty Queen for £10 from Birchbox. Wild About Beauty’s Rose Water Illuminating Serum is a serum packed with light-reflecting particles, organic rose water and caigua extract to revitalise and regenerate the skin in an instant. In addition to this, it also contains pearls to add luminosity and has anti-oxidant, anti-aging and skin soothing properties. 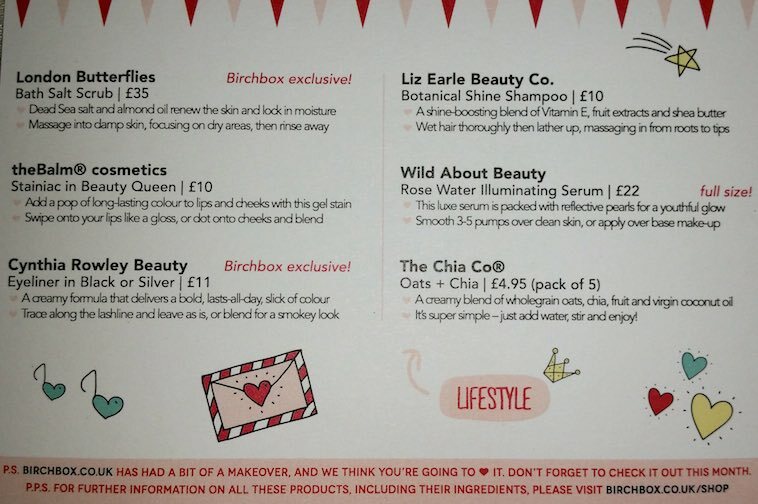 Birchbox and Wild About Beauty kindly provided people with a full-size tube of this product rather than a sample, so that is £22 worth of product included in a box that only sets you back £12.95 (including postage and packaging), so that’s not bad! To use, you need to apply 3-5 pumps to clean skin before makeup either over moisturiser or without it. Upon use, I was first quite distracted by how pretty the serum itself looks! It also has a beautiful rose water scent. However, the important thing is how the serum works, not how pretty it looks. Usually I’m not a fan of illuminating creams as they make my skin more oily than it already is (and I have very oily skin). However, this serum actually has a subtle brightening effect on my skin that I like, but only if I use a little less than it suggests. All in all though, this is an illuminating product that actually gets my seal of approval and will be used! 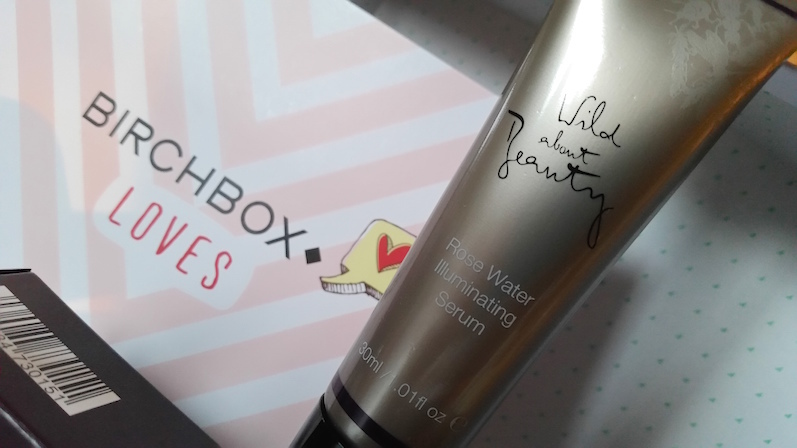 You can buy a full-size, 30ml tube of Wild About Beauty Rose Water Illuminating Serum for £22 from Birchbox. Cynthia Rowley Beauty Eyeliner in Silver is a creamy, metallic eyeliner to a provide smudge-proof pop of colour that lasts all day. 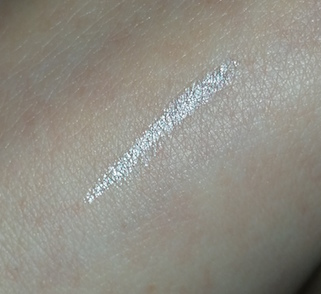 This eyeliner comes in a range of five colours, but as already mentioned, my Birchbox included the silver shade. Application of this eyeliner is so smooth and easy with no tugging. The line is also quite bold without having to apply any extra, so you can have a nice, metallic line in no time at all. Removal of the Cynthia Rowley Beauty Eyeliner is fairly easy, but may be a little stubborn in some patches. It may also leave remnants of glitter around your eyes after removal that can be a bit of a pain to budge! Overall though, it's a great product. You can purchase a full-size, 1.13g Cynthia Rowley Beauty Eyeliner for £11 from Birchbox. The Chia Co. Oats + Chia in Mixed Berry is a tasty, dairy free breakfast that consists of oats and chia seeds with dried fruit. It contains wholegrain oats, virgin coconut oil, sun-ripened chia and coconut palm sugar and can be made up in a minute or so. These oats were quite tasty! Whilst I'm never that great with trying to review food products, I can say that this is a product that I would eat again. As well as Mixed Berry, the Oats + Chia also come in Apple Spice and Banana Mango. 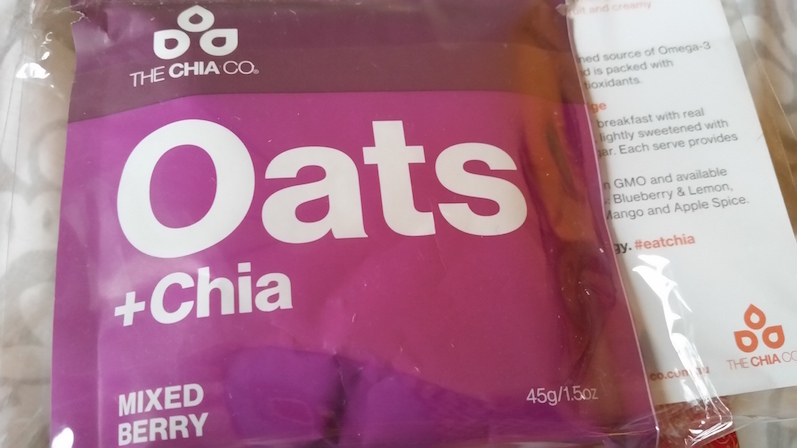 You can purchase a pack of five sachets of The Chia Co. Oats + Chia for £4.95 from Birchbox. Overall, I am a big fan of this box! There wasn’t anything included that I disliked, and I usually know that I’m impressed with a box when I have a difficult time trying to pick the “stand-out” item. If I was forced to choose just one favourite out of this box, I would potentially say the London Butterflies Dead Sea Salt & Sweet Almond Oil Bath Scrub, but even still I would then feel bad for leaving out the Liz Earle Botanical Shine Shampoo, theBalm Stainiac and the Cynthia Rowley Beauty Eyeliner in Silver. I’m even happy with the Wild About Beauty Rose Water Illuminating Serum even though I’m not usually a fan of them and I also enjoyed the Oats + Chia. That actually means that I have included every single item that I received as my top pick paragraph this month. Whilst delivery was a little bit better this month, I still seem to be receiving my box over a week or so later than a lot of other people are over on the Facebook page. Once I received my dispatch E-Mail I had it within two days, but my dispatch E-Mail didn’t land in my inbox until roughly a week after a lot of people were posting that they had received their box! This month there are a couple of different codes that you can use upon subscription. For a free Pixi by Petra Shea Butter Lip Balm in Ripe Raspberry, mini Lord and Berry Couture Kohl Kajal Eye Pencil in Black, a sample of English Laundry's No.7 For Her and a pink Birchbox pouch, simply use the subscribe link above and use the code VALENTINE at the checkout. For 3 free deluxe Benefit samples you can use the code EYEFUL at the checkout. 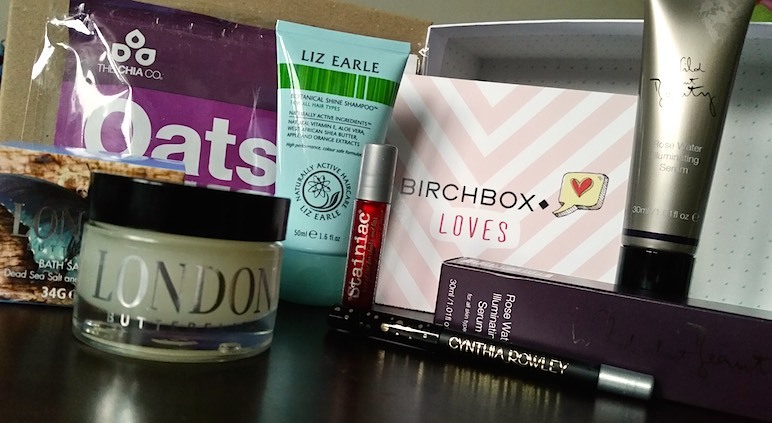 If you are a fan of Benefit Cosmetics then now is a great time for you to sign up to Birchbox. The March box allows you to pick your own Benefit mascara sample (you can choose between They’re Real, Bad Gal and the brand new Roller Lash).